Congratulations, your site received (46) points qualifying it for the DRH Design Award for 2005. Thank you for the invitation to visit your website. I enjoyed my time looking through your creation. The theme, background, navigation, and purpose are excellent. Your design clearly reflects high quality in content and visual elements. I really enjoyed looking through your spider collection and learning more about them. It is obvious that you are very knowledgeable on your subject matter and the information you provide is a valuable treasure. Thank you for visiting my site and applying for an award. I have visited your site today and think you have done an excellent job! Therefore, it gives me great pleasure in presenting you with the Award of Excellence Gold. Your web site shows excellence in layout and design, navigation, site content, presentation of pictures and graphics, color/font/text choices, and it's family-friendly as well ... I am deathly afraid of your little friends, Tim, but you make me almost want to adopt one, as your overall presentation is one to be envied. It is with pleasure that I award your web site, Tim’s Spider Corner, with the Adagio Gold Award. It is not just your inovative design that is worthy of this award, but all aspects of your site. Congratulations! This is not an easy award to win, and you are only my second gold winner since the Adagio Awards began in March 2004. We, the staff of Keepsake Awards, would like to congratulate you on an excellent web site, which our Judges found a pleasure to review. We are pleased to present you with our GOLD Award. Our criterion is very strict and to achieve an award means that your site is a Keepsake for generations to come. We have reviewed your website Tim’s Spider Corner and we are pleased to inform you that you have earned Valkyrie’s Gold Award. We enjoyed our visit to your site and we came away knowing we had learned something. Your design and navigation is excellent. Well done Tim and once again congratulations! Tim brings a charm to spiders I never would have thought possible. Nice clean design with fascinating information. First let me say thank you for allowing be the privilege to evaluate your site for this award, it's not easy to win and many do not but...drum roll...Congratulations! You site has qualified for the WM8C's Ham Links Stamp of Excellence Award. You site is extremely well done, very easy to navigate and a great addition to the world wide web. I can see you have spent a lot of time perfecting you site. Once again, congratulations! Congratulations Tim Beylemans, your website has won the Fifth Alcazarén Gold Award. The content, design and navegation of the Tim's Spider Corner page has been evaluated with an excellent scoring . It has been a pleasure to revisit your site a offer you the upgrade. The information about the bird eating spiders is extense and interesting, your website design is superb and perfectly matches it's content, your Award Program and your compliance with the W3C is also considered and shows the effort and dedication put in the enhancement of the website, it clearly deserves the award. As one of Worlds peak internet bodies, the Awards of The World Wide Web Awards are amongst the most prestigious available and hence, amongst some of the more difficult to win on the web. Congratulations! Your site at: Tim's Spider Corner has been selected to receive the World Wide Web Awards "Gold" Award. Once again, your site displays an excellent layout and design of website, clean design, interesting content, nice graphics and a wonderful award program. Your site is a wonderful contribution to the internet community. The Lynx Award for this month. Platinum Site of the Month for April. 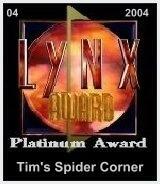 The Lynx Award is rated 4 by Award Sites. I truly enjoyed visiting your site. It is evident that you have put a lot of hard work into your site. It is an honour to present the Lynx Award to you. Your site is the first to gain the Ruth’s Haven Diamond Award for 2004. We at Ruth’s Haven found your site to be very interesting, informative and exceptionally well presented. It is a pleasure when a site such as yours is on the net. Thank you so much for inviting us to your site and letting us learn about the bird spiders and the many aspects of them. I want to congratulate you on winning the Day dream award for the site Tim’s Spider Corner a much worthy upgrade. I am pleased to annouce your site has been reviewed and you have won the Trinity's Web Design Excellence Award for Graphical, Multimedia & Flash Excellence. Very Creative! I truly enjoyed your concept and design... While spiders creep me out personally, I will use your presentation in my 7th grade science class for a interesting and unique presentation of your spider information. WELL DONE! Due to the high quality of your website, we are delighted to be able to award you our Prospective Gold Award, which is very difficult to win (you're only the seventh winner) ! On Tim's Spider Corner you find a lot if useful information about all kind of spiders, well presented. Here you can learn love spiders. The loading time is very quick and I love your design, it is wonderful. I wish you all the best for the future. It was a pleasure reviewing such a wonderful site! Your site is very informative and it loads fast in Internet Explorer, Netscape Navigator & Opera Browsers. Design, Navigation, Coding, Meta Tags, Grammar & content are excellent. Congratulations with winning this LTS Grail Award. You are the 17th winner of this award since it came into being in June 2002, which is indeed an achievement! You scored 92 points out of the possible 100! We have thoroughly enjoyed ourselves on your site. It's full of very interesting information on spiders and as such an added value to Internet as a whole. My compliments for a great site.